Continued advances in cardiology have led to unprecedented scientific progress in recent years. However, no matter how advanced the science, the successful application of interventional cardiology relies upon a practitioner’s ability to approach interventional techniques competently and confidently in every situation. 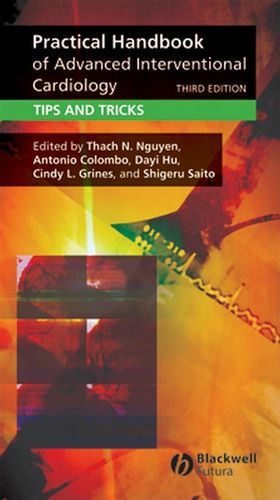 Fully updated and featuring new chapters and additional tips and tricks, this latest edition of Dr Nguyen, Colombo, Hu, Grines, and Saito’s celebrated book provides a complete yet concise guide to practical interventional cardiology that deserves a place in every cardiac laboratory. Culled from the personal experience of over fifty international experts, the book incorporates more than 500 practical tips and tricks for performing interventional cardiovascular procedures. Each strategic or tactical move is graded by complexity level and described in a simple, step-by-step approach that includes guidance on how to overcome practical difficulties, providing a comprehensive resource that can benefit both beginner or experienced operators. As well as covering the latest developments in interventional cardiology, this third edition includes technical tips that promote user-friendly performance, low complication rates, cost- and time-efficient approaches and cost- and time-effective selection of devices to help optimize the practice of modern interventional cardiology. Dr Thach N Nguyen is director of cardiology at Community Health System, St Mary Medical Center, Hobart IN. Since 1992, he actively participated in the organization of the Great Wall International Congress of Cardiology, the largest cardiology educational meeting for China. His major publications include Management of Complex Cardiovascular Problems (second edition in English, Spanish and Vietnamese 2002). Practical Handbook of Advanced Interventional Cardiology (2nd edition Blackwell, Oxford, UK, 2003, 3rd edition, Blackwell, Oxford, UK, 2007). He has an academic appointment at Indiana University School of Medicine, honorary professorship of medicine at the Capital University of Medical Sciences and the Institute of Geriatric Cardiology of The Central People Liberation Army Hospital 301, Beijing, China. He is editorial consultant for the Journal of Interventional Cardiology and co-editor of the Journal of Geriatric Cardiology. Dr. Antonio Colombo is an expert interventional cardiologist with a very large experience in coronary stenting and peripheral vascular disease, angioplasty and stenting. His particular fields of expertise are treatment of chronic total occlusions and treatment of diffuse disease in the performance of procedures which demand the usage of atherectomy devices. Dr. Colombo practices in Milano, Italy, as well as in New York, USA at Columbia Medical Center. Chapter 1 Vascular Access: Thach N. Nguyen (St Mary Medical Center), Hoang Pham (Saint Vincent Hospital) and Ta Tien Phuoc (Bach Mai Hospital). Chapter 2 Angiographic Views: Thach N. Nguyen (St Mary Medical Center), Kim Sui Hian (Sarawak General Hospital), Neal Shah (St Mary Medical Center), Timothy J. Yee (St Mary Medical Center) and Norbert Lingling D. Uy (University of the East Ramon Magsaysay Memorial Medical Center). Chapter 3 Guides: Thach N. Nguyen (St Mary Medical Center), Tan Huay Cheem (National University Hospital, Singapore) and Abhiram Prasad (Mayo Clinic). Chapter 4 Wires: Thach N. Nguyen (St Mary Medical Center), Jui Sung Hung (Central Taiwan Heart Institute) and Hai Yun Wu (General Hospital of the Chinese People’s Liberation Army). Chapter 5 Balloon Angioplasty: Thach N. Nguyen (St Mary Medical Center), Thomas Ischinger (Interventional Cardiology Heart Center), Vo Thanh Nhan (Cho Ray Hospital) and Rajiv Kumar (Indiana University School of Medicine). Chapter 6 Stenting: Thach N. Nguyen (St Mary Medical Center), Pham Manh Hung (Vietnam Heart Institute), Dinh Duc Huy (Tam Duc Hospital), Nguyen Huynh Khuong (Hospital 115, Hochiminh City) and Nikola Bakraceski (Institute for Cardiovascular Diseases). Chapter 7 Transradial Approach: Alexander Doganov (National Heart Hospital), Valeri Gelev (National Heart Hospital), Valentin Krastev (National Heart Hospital), Phan Nam Hung (Binh Dinh General Hospital). and Shigeru Saito (Shonan Kamakura General Hospital). Chapter 8 High-Risk Patients: Thach N. Nguyen (St Mary Medical Center), Pham Nguyen Vinh (Heart Institute of Ho Chi Minh City), Gaurav Kumar (University of Illinois in Chicago), James Nguyen (Orlando Regional Health Care),. Nguyen Canh Toan (Vietnam Military Medical University), Shi Wen Wang (General Hospital of the Chinese People’s Liberation Army) and Olabode Oladeinde (St Mary Medical Center). Chapter 9 Left Main: Run Lin Gao (Cardiovascular Institute and Fu Wai Hospital, Chinese Academy of Medical Sciences). Chapter 10 Chronic Total Occlusion: Etsuo Tsuchikane (Toyohashi Heart Center), Osamu Katoh (Toyohashi Heart Center), Takahiko Suzuki (Toyohashi Heart Center), Sunao Nakamura (New Tokyo Hospital),. Thach N. Nguyen (St Mary Medical Center) and Shigeru Saito (Shonan Kamakura General Hospital). Chapter 11 Ostial Lesions: Szabo Szabo (St Mary Medical Center) and Thach N. Nguyen (St Mary Medical Center). Chapter 12 Acute ST Segment Elevation Myocardial Infarction: Marko Noc (Medical School of Ljubljana), Thach N. Nguyen (St Mary Medical Center), Vijay Dave (St Mary Medical Center), Do Quang Huan (Vietnam Heart Institute),. Nithi Mahanonda (Piyavate Hospital) and C. Michael Gibson (TIMI Data Coordinating Center). Chapter 13 Interventions in Patients after CABG: Thach N. Nguyen (St Mary Medical Center), Teguh Santoso (University of Indonesia Medical School), Hsien-Li Kao (National Taiwan University Hospital), Muhammad Munawar (University of Indonesia) and Nguyen Quang Tuan (Vietnam Heart Institute). Chapter 14 Bifurcation Lesion: Thach N. Nguyen (St Mary Medical Center), Lefeng Wang (Heart Center, Beijing Red Cross Hospital and Cardiovascular Institute), Moo-Huyn Kim (Dong A University Medical School) and Antonio Colombo (San Raffaele Scientific Institute). Chapter 15 Complications: Ashok Seth (Max Heart and Vascular Institute), Nguyen Ngoc Quang (Vietnam Heart Institute) and Thach N. Nguyen (St Mary Medical Center). Chapter 16 Interventions in Patients with Bleeding or Bleeding Tendency: Thach N. Nguyen (St Mary Medical Center), Lan Nguyen (St Mary Medical Center), Priscilla Wan (St Mary Medical Center) and Cayi Lu (General Hospital of the Chinese People’s Liberation Army). Chapter 17 Removal of Embolized Material: Kirk Garratt (Lenox Hill Hospital) and Thach N. Nguyen (St Mary Medical Center). Chapter 18 Carotid Intervention: Kasja Rabe (CardioVascular Center Frankfurt), Jennifer Franke (CardioVascular Center Frankfurt) and Horst Sievert (CardioVascular Center Frankfurt). Chapter 19 Subclavian Artery Interventions: Gianluca Rigatelli (Rovigo General Hospital) and Paolo Cardaioli (Rovigo General Hospital). Chapter 20 Renal Artery Interventions: Gianluca Rigatelli (Rovigo General Hospital) and Paolo Cardaioli (Rovigo General Hospital). Chapter 21 Endovascular Repair of Abdominal Aortic Aneurysm: David Jayakar (St Mary Medical Center), Damras Tresukosol (Her Majesty’s Cardiac Center, Siriraj Hospital), Thach N. Nguyen (St Mary Medical Center) and Ramon Llobet (St Catherine Hospital). Chapter 22 Iliac Artery Stenosis: Gianluca Rigatelli (Rovigo General Hospital), Paolo Cardaioli (Rovigo General Hospital) and Rosli Mohd Ali (National Heart Institute, Kuala Lumpur). Chapter 23 Infrainguinal and Infragenicular Interventions: Prakash Makam (Community Hospital, Munster) and Thach N. Nguyen (St Mary Medical Center). Chapter 24 Inoue Balloon Mitral Valvuloplasty: Jui Sung Hung (Central Taiwan Heart Institute) and Kean-Wah Lau (National University of Singapore). Chapter 25 Retrograde Percutaneous Aortic Valvuloplasty: Ted Feldman (Evanston Hospital). Chapter 26 Percutaneous Implantation of Aortic Valvular Prosthesis (Self-expanded Prosthesis): Eberhard Grube (Heart Center, Siegburg) and Lutz Buellesfeld (Heart Center, Siegburg). Chapter 27 Percutaneous Implantation of Aortic Valvular Prosthesis: John G. Webb (St. Paul’s Hospital) and Lukas Altwegg (St. Paul’s Hospital). Chapter 28 Intervention in Intracranial Arteries: Sundeep Mangla (SUNY Downstate Medical Center). Chapter 29 Percutaneous Interventions in Adults with Congenital Heart Disease: Phillip Moore (University of California at San Francisco), Huynh Tuan Khanh (Pediatric Hospital #2, Hochiminh City), Zhang Shuang Chuan (Peking University affiliated with Shenzhen Hospital), Nguyen Thuong Nghia (Cho Ray Hospital) and Nguyen Lan Hieu (Hanoi Medical University, Vietnam Heart Institute). Chapter 30 Delivery of Biologics for Angiogenesis and Myogenesis: Peter K. Law (Cell Transplants Asia Limited), Sze Piaw Chin (International Medical University), Huynh Duong Hung (St Mary Medical Center), Thach N. Nguyen (St Mary Medical Center) and Quan Zhou Feng (General Hospital of the Chinese People’s Liberation Army).